I read this article and found it very interesting, thought it might be something for you. The article is called Uttar Pradesh’s Sorry Record Of Custodial Deaths and is located at https://archive.indiaspend.com/investigations/uttar-pradeshs-sorry-record-of-custodial-deaths-16389. 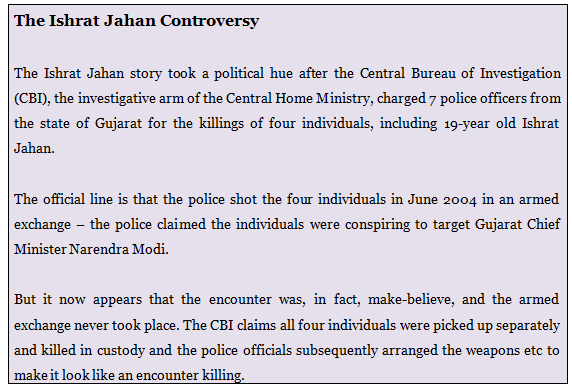 The issue of custodial and encounter deaths have come back into focus in light of the Ishrat Jahan controversy. The controversy surrounds the 2004 killing of a 19-year-old girl by the Gujarat state police, allegedly in a fake encounter. While custodial deaths are periodically reported, the numbers, in aggregate, are indeed worrying. Particularly, in some states like Uttar Pradesh where 1,431 people were killed in custodial deaths in the 5 years from 2005 to 2010. 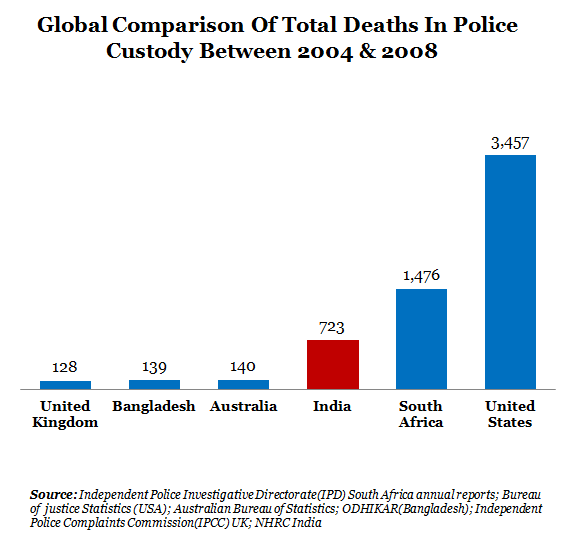 The number is more than the total deaths in police custody for many large countries like UK and Australia during the same period. So, how do we define custodial deaths? Custody deaths are incidents of death of a person arrested or remanded to police custody by court or under-trial prisoners while in the custody of law enforcement bodies. Custodial deaths can be classified into three broad categories: death in police custody, death in judicial custody and death in custody of defense/paramilitary forces. 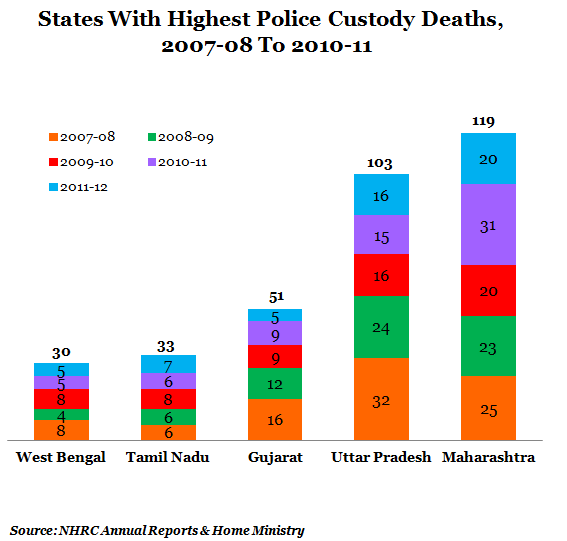 Maharashtra has the highest number of deaths in police custody at 119 from 2007 till 2012 including a spike in cases reported in 2010-2011. In comparison to deaths in judicial custody, the number of incidents of death in police custody is relatively low across all states. Custodial torture is the highest in Uttar Pradesh- a total number of 1,963 from 2008-2012. The total numbers for U.P. are more than 10 times higher than the next highest state, which is Tamil Nadu. U.P and some other states saw a spike in the number of cases of custodial torture in 2010-2011 but the consequent year saw a decline although a sizeable number of custodial torture cases are still reported from Uttar Pradesh. Uttar Pradesh and Bihar show high number of pending cases for the time period of 2005 – 2010.The total number of complaints also relate to cases of illegal arrest/detention, indignity to women/sexual harassment and dowry deaths including custody deaths. 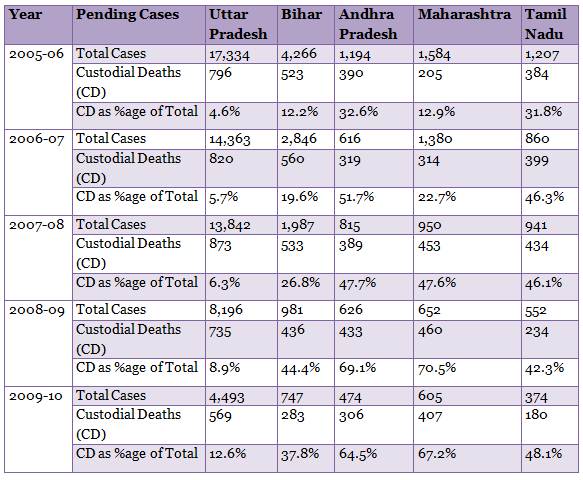 The table below shows the total number of cases pending with the National Human Rights Commission (NHRC) relative to the pending cases of custody death. We see that Uttar Pradesh had shown an increase between 2005-2008, peaking at 873 pending cases of custody death in 2007-08but has shown a downward trend from 2007- 2010. Although the total pending cases has reduced over the years, the number of pending custody death cases have not shown the same reduction. This applies generally for all the states under review. 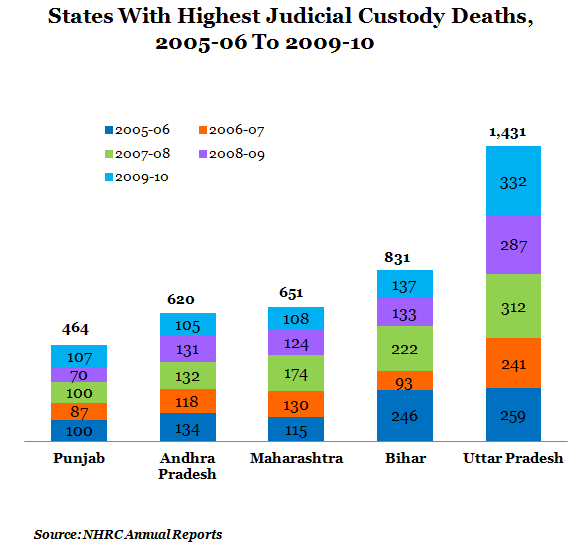 So, we see that the picture is starker for states like UP and Bihar, which are already reporting a high number of custody deaths but considering the pending cases, that number could be a lot higher in a given year. If we do a comparison with other countries, India shows a better picture when compared with United States and South Africa but is doing a lot worse compared to UK, Australia and Bangladesh. Source: Independent Police Investigative Directorate (IPD) South Africa annual reports; Bureau of justice Statistics (USA); Australian Bureau of Statistics; ODHIKAR (Bangladesh); Independent Police Complaints Commission (IPCC) UK; NHRC India. Custodial death is an issue for which an effective solution has not yet been found. 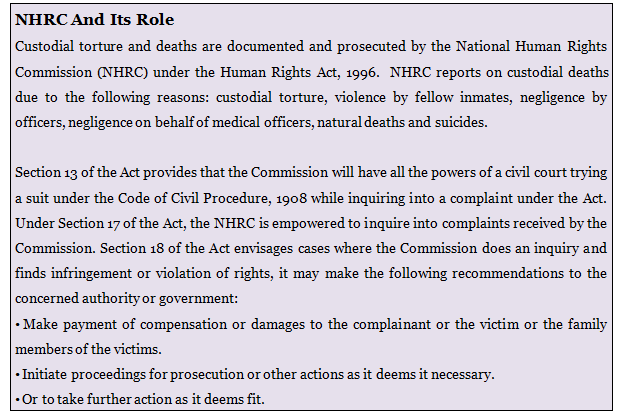 The NHRC, under the statute, is only an advisory body, and the Central Government cannot take action directly since “police” and “public order” are state subjects. So, the State Governments have to operate effectively to curb the problem. But it is evident from the data that the cases of custodial deaths/violence are still not declining. Also to be noted is that the state authorities are not acting promptly to close files of custodial deaths. While NHRC recommending monetary relief is a necessary step for the sake of the victims and the family of the victims, consequences for erring public servants are an important step in bringing down the number of custodial deaths. The United Nations Special Rapporteur on extrajudicial, summary or arbitrary executions visited India in March 2012. 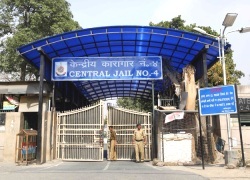 The report, which was published in 2013, recognized a study conducted by the Asian Centre for Human Rights, which presented the statistics collected by NHRC showing 1,504 cases of deaths in police custody and 12, 727 cases of death in judicial custody from 2001-2010. Amnesty International also highlighted the issue in their annual report for 2013 for India where they say that during 2007-2012, NHRC declared monetary compensation for 191 of the 1,671 cases of death in extra-judicial killings. However, the report suggests that criminal investigations into majority of such killings failed to make serious progress.